Kravan Temple is a small 10th century temple consisting of five reddish brick towers on a common terrace, located at Angkor, Cambodia south of the artificial lake or baray called Srah Srang. Its original Sanskrit name is unknown. 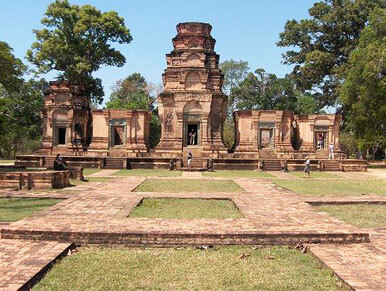 The modern name in Khmer, “Prasat Kravan”, means cardamom temple. The temple was dedicated to Vishnu in 921 CE, according to inscription on door jambs. The site was cleaned from vegetation in the Thirties by Henri Marchal and Georges Trouvè. Afterwards the towers were restored on Bernard Philippe Groslier’s initiative from 1962 to 1966, adding some new bricks which are marked with a “CA” (meaning “Conservation Angkor”). The temple is oriented to the East and surrounded by a small moat. Its exterior is striking for its classical lines and symmetry, the central and the south tower have superstructures which take advantage of false prospective by simple means of diminishing tiers. 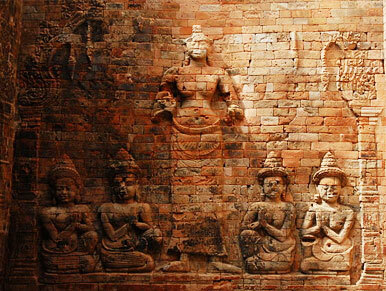 The sanctuaries interiors are remarkable for the large bas relief depictions of Vishnu and Lakshmi that have been carved into the walls of reddish brick, connected by a vegetable compound. This type of sculptured artwork rather common in Cham temples, but almost unique in known Khmer monuments. Tip: The reliefs in this tower are best viewed in the morning when the east light enters the door, in the afternoon they are barely visible. It was built in the first half of the tenth century (921) by Completed during the reign of Harshavarman 1 (it may have been built by high court officials) in Hindu religion with following transitional from Bakheng to Koh Ker. The main point of interest at Kravan is the sculpture on the interior of two of the five towers depicting Visnu and his consort, Laksmi; the scene in the central tower is the most impressive one. 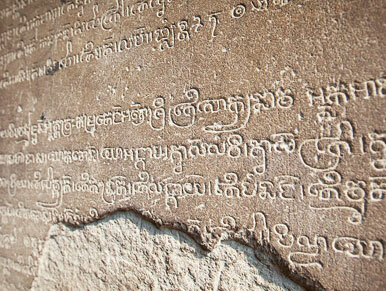 These carvings in brick on the interior of a monument are unique in Khmer architecture. This temple was reconstructed by the French and given a new foundation, interior walls and drains. Some broken bricks were replaced with carefully made reproductions which are marked with the letters CA; representing the Angkor Conservancy These can be seen, for example, on both the interior and exterior of the tower on the right. Kravan is an unusual arrangement of five towers in a row on one terrace. They are built of brick; the lintels and columns are of sandstone. This is the only tower with recessed tiers intact, which are visible on the interior. The columns are octagonal, with four bare sides and sandstone rings. This tower enclosed a linga on a pedestal. An inscription on the pillars gives the date 921 for the erection of the statue of Visnu on the interior Decoration (exterior): The east side of the Central Tower is sculpted with male guardians in shallow niches and chevrons and framed figures on the pilasters. A frieze of small heads adorns the lintel. Decoration (interior): The main decoration of this tower, on the left, depicts Visnu taking three steps to span the universe and to assure the gods of the possession of the world. It comprises a standing image of Visnu (with four arms) carrying his attributes-a disc, a ball, a conch and a club. One of his feet rests on a pedestal; nearby a person is meditating and another one is walking on a lotus held by a woman on a background of undulating lines representing the waves of the ocean. On the right, Visnu (with eight arms) is framed with six registers of people meditating and a giant lizard. This sculpture on brick was formerly coated with stucco and was probably highlighted with colours.